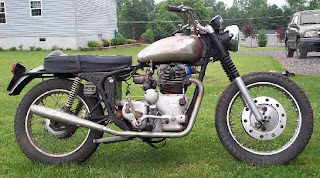 It's probably every enthusiast's dream to find a forgotten Royal Enfield Interceptor in a barn, bring it home, clean it up and discover a nearly complete and valuable motorcycle shining through the muck. Usually forgotten, in this day dream, is what else lives in the barn. "I don't know where to start. The beginning I guess. Several years ago a coworker says to me, 'Al you're into British bikes aren't you?' 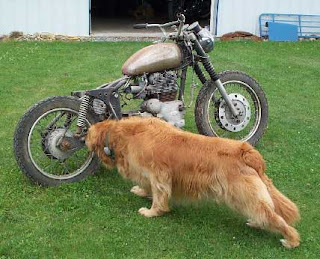 He just got a Royal Enfield from his father-in-law's barn. Paid $150 for it. After talking to him we determined it was an Interceptor. "Well, I ran into him two weeks ago and asked him again. This time he asked if I wanted to buy it. Wow! After a discussion with the chief financial officer (Mrs. Eckstadt) I got the OK to seriously look at it AND if it was under $500 I could bring it home. "I went to see it and I was kind of stunned because it was not the way I pictured it in my mind. The bike was covered in crud and partly disassembled. A basket case, literally with a bunch of small parts in a little wicker basket. "He wanted $400, I asked if he would take less and he said $300 would be OK. As bad condition as it was, I figured I can't lose at that price even if it was sold for parts. I brought it home that morning. I got a bucket and soap and started scrubbing the mud and pig slop off it. (Oh man it smelled BAD and still isn't too fresh)." Al sought help from the forum, identifying the year and model of his Interceptor. He got it, too, right away. 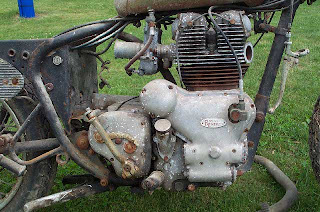 Chris Overton identified it as a 1967 Series 1A, a "factory customized" TT7 model. "You are one lucky guy. 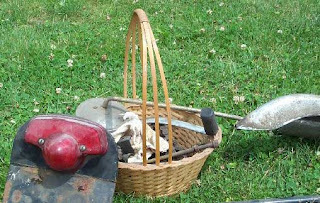 A good barn find at a bargain price. Tell me if you would like to double your money!"